This is my first Batman cowl sculpture. 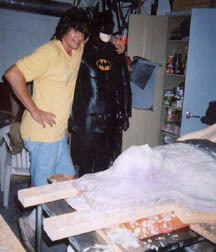 I completed it in 1993 and went on to make a full first Batman costume for myself since back then that was the only way you could get one. Plus Catwoman is in Returns. Nuf said. Oh no! Batman is completely immersed in quick dry cement. Can he escape in time? My trusty partner and best friend "Eric The Menace."